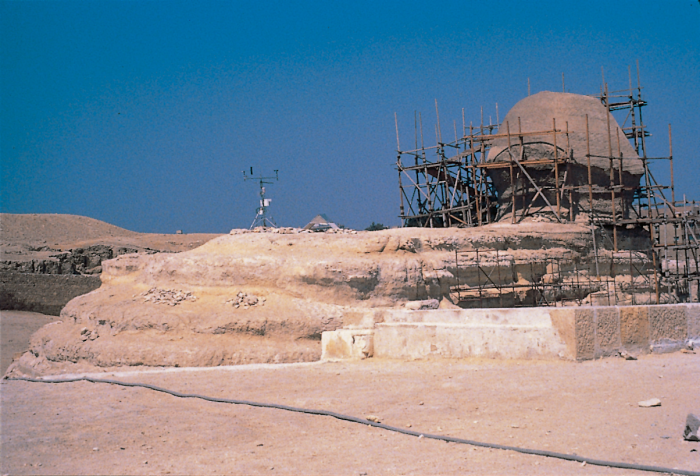 A Campbell Scientific weather station, installed on the back of the Sphinx in May of 1990, provided environmental data needed for the restoration and preservation of the ancient structure. Parameters measured by the station include wind speed and direction, air temperature, relative humidity, and precipitation. The data collected after a year of monitoring indicated a greater fluctuation in relative humidity and air temperature than had been expected. The station also measured higher-than-expected wind speeds and helped identify northwest winds as the main source of wind erosion.